August has been a month of slow mornings. I wake up and pull my hair into a ponytail, then lace up my sneakers and head out into the city. I pass the cars on their way to work, and end up on the canal, quiet and empty. I run up to the bend and back down, by the ducks sleeping on the edge of the sidewalk, soaking in the summer heat. No headphones needed, just enjoying the silence of the small-city morning. Sometimes I wish I could live this life every day, slow mornings and pretty photos to document it. Pretty things and no stress as to how to pay for them. The life where the lighting's always beautiful and the scenery, sublime. A life where I could savor the day away. Savor, to enjoy something completely and wholeheartedly. A word that becomes buried under the stress and anxiety of life, whether it's work or the long list of errands for the weekend. I understand, far too often I'm the one who gets preoccupied by both. But vacation has left me thoughtful and here I am rambling about that slow living I see on the Internet, desirable yet sadly unattainable in a lot of ways. But that's okay. Because 'savor' is just merely a close cousin to another word, 'mindfulness'. Mindful, to be conscious or aware of something. What could happen regardless of the life that we've chosen, busy or not. It doesn't require the best food, the nicest clothing, the prettiest scenes. Just your head and your heart. Lately I'm trying to be more mindful. Trying to pick up the nuances of life - like the silence along the canal in the morning. The smells of the donut shop Saturday mornings. The happiness sharing cake with a group of girlfriends during the weekday. It's a humbling practice, and a gratifying one. Mindfulness reminds me that I live a damn good life, even if it's not the slow, idyllic, easy-living ones I dream of from time to time. Here's to continued mindfulness. While I do have this vacation month though, I have been savoring the last bits of it in all the different ways - picnics, morning runs, Saturday morning donuts. And baking. Lots of it, since I know that during rotations baking can't be quite as rigorous. Especially baking with summer fruits, which has fueled a lot of my creativity this past month. Along with seeing all the beautiful galettes on Instagram this season, but pie dough still intimidates me, especially when not even all my kitchen equipment is in this little apartment I've been living in this month (will be moving to the new, more permanent place in a couple of weeks). So cake it was. Specifically, a nectarine cake inspired by the queen Ina Garten and her fresh peach cake recipe. Since it came from Ina, I knew it'd be good. The end result is a cake similar to coffee cake, with hints of cinnamon and cardamom to warm you up in the morning and sweet bites of nectarine slices that remind you to continue to savor the summer. Preheat oven to 350 F. Butter and flour an 8 inch round pan. If you haven't sliced your nectarines, now would be a good time! In a medium bowl, whisk the flour, baking soda, baking powder, salt, cinnamon, and cardamom until well combined. Set aside. In the bowl of a stand mixer, beat the butter and sugar until light and fluffy, about 5 minutes on medium-high speed. You can also use a hand mixer if you don't have a stand mixer! Add the eggs in 1 at a time, beating in between each addition. Add the vanilla and beat until combined. Add half of the flour mixture and mix until combined. Add the sour cream and mix again. Finally, add the last half of the flour mixture and mix until just combined. 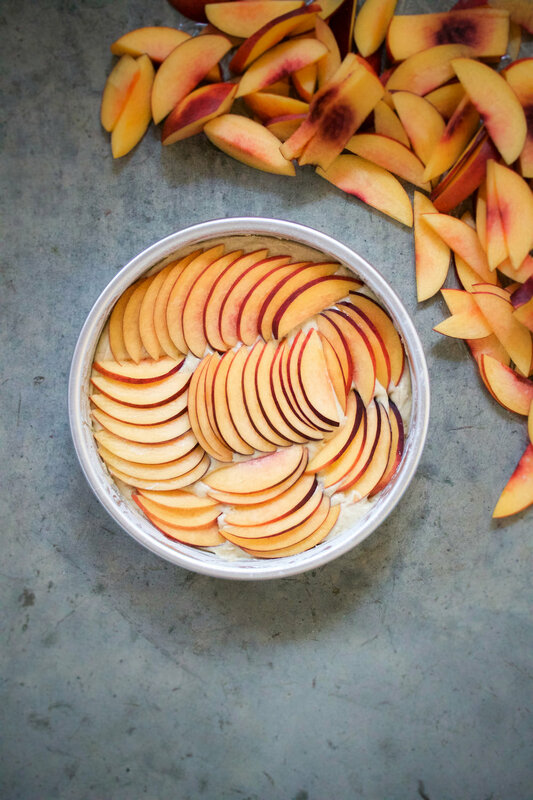 Pour half of the batter into the tin and then place a layer of the sliced nectarines over it. Top with the remaining half of the batter and place another layer of sliced nectarines, with the nectarines slightly overlapping each other to get a "fan" effect. Sprinkle with turbinado sugar on top, then place in the oven. Bake the cake for 50-60 minutes, or until a toothpick inserted in the middle of the cake comes out clean. You will likely have to cover the top of the cake at around the 35-40 minute mark to prevent the top from browning too quickly. Remove the cake from the oven and let cool for 20 minutes before removing it from the pan. Place it on a cooling rack and let it cool some more. Enjoy in the mornings, warm or at room temperature, with a cup of coffee. If you need to heat up the cake, it microwaves quite well!